What’s chocolate got to do with it? What on earth has chocolate got to do with Easter? This has always baffled me and I am sure it has you, however the traditional (or religious) meaning behind Easter is behind the celebration of the resurrection of Jesus Christ. So what has Chocolate eggs got to do with it? Originally was not allowed by the church during the week leading up to Easter (known as Holy Week). Any eggs that were ‘laid’ that week were then decorated and presented to children as gifts. Throughout time this evolved, with the Victorians adapting the tradition to decorate ‘satin-filled’ cardboard eggs with Easter gifts. It wasn’t until the 19th Century that both France & Germany began to introduce the first chocolate eggs. As the majority of us are ‘sweet-toothed’, this is where the popularity rose to the tradition of providing Chocolate eggs once a year (or more in other peoples cases). My two girls are getting very excited about Easter; especially my youngest who is a chocoholic. 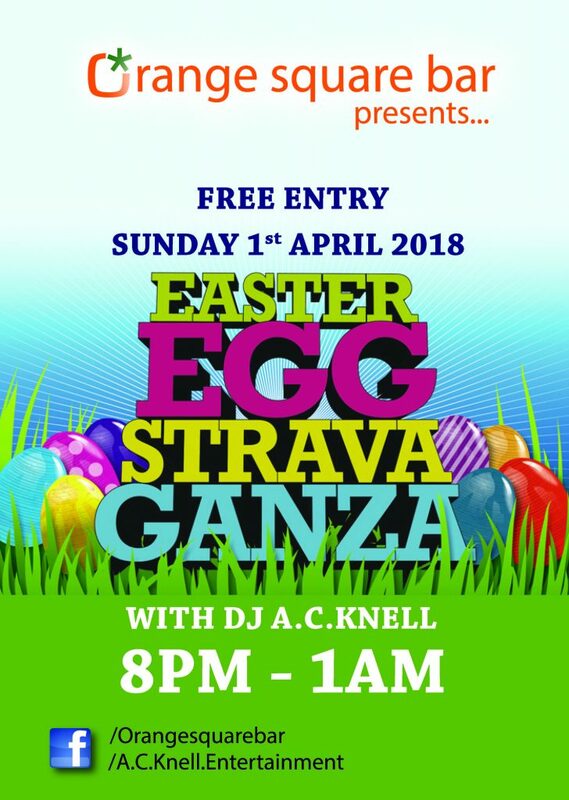 Easter is a great time to celebrate as well, given the Bank Holiday it falls on so we tend to with an ‘Easter-themed’ event every year! Unsure of what your plans are for Easter? It’s Free Entry all night and all the fun begins from 8PM onwards. I’ve known Adam for years and was always confident in his ability to entertain the dance floor. Booked him for my engagement party and was so impressed with his service. Arriving at the venue early to set up, a tailored playlist, got everyone dancing, threw in some photography (nice touch) and seemed to really enjoy helping make our evening so great! Can’t recommend him highly enough, will be using again with confidence. Nice one Knell! We booked AC Knell for our wedding celebration and he was certainly worth every penny and I would highly recommend Adam to anyone looking for a DJ. Adam also offered to take photos throughout the night (which he sent me the next day) at no extra cost so we have some great photos of guests enjoying themselves on the dance floor. Thanks again Adam, we had a great night. Fantastic evening with fantastic music. Adam played all the songs we requested and kept the dance floor full all evening. The photos are a nice bonus too! Will definitely be using Adam again. Adam was the dj at mine and my friends joint 30th party he played everything we asked for was easy to communicate with prior to the party and took some lovely photos. I wouldn't hesitate to recommend. Adam was the DJ at our wedding and was fantastic. He always knew what to play to keep everyone dancing. We had a great time and I think that shows in the photos. Thank you so much. Adam was our wedding DJ at the beginning of this month and I can't recommend him enough. He was so friendly and helpful which took away the stress of arranging our evening entertainment. The music was great which meant I hardly left the dance floor. Thank you so much, Adam. We had the best night! Adam was recommended to me by so many people to DJ at my 50th Birthday party and I’m so happy that he was. From the first time that I contacted him, he was so helpful and friendly and nothing was too much trouble. Throughout the evening he would check I was happy and everything was ok and a bonus is that he takes photos as well, so I have some Lovely photos of my night, which meant I could relax and not worry about taking any and they were all uploaded the next day. The icing on the cake was he helped my daughter and her fiancée get home as there was no available taxis because of the snow. A true gent and an amazing DJ. Thank you so much Adam. Adam was the DJ at our wedding in July and was just brilliant! He had everyone up dancing all night and would most defiantly use again for any future events!! We cannot recommend this DJ enough! He played at our venue Chapel Barn and was a delight to work with. Very professional and everyone had such a fun time. Adam was the DJ at our wedding and was fantastic. He kept the dance floor busy and was happy to take requests and play songs from a list we had sent him. He always knew what to play to keep everyone dancing. Adam took photos during the evening and got shots of the end of the night once photographer had left. If you are looking for an amazing DJ this is your man. Thank you so much Adam. Adam was the DJ at our wedding and we can't recommend him highly enough. He was professional, friendly, happily took requests, took photos through the night and even joined in! Even the guests commented on how good he was! Excellent mix of music and people were dancing all night! Thank you Adam! Adam was the DJ at my 21st, couldn't have wished for anything better! Great music that kept us dancing all night! He will definitely be at my next party.. Thankyou Adam! Adam did my 40th birthday last weekend and was fab. Top tunes....excellent DJ who knew just what tunes to play for the crowd! What an amazing day, thank you Adam for playing at our wedding you were fantastic. Could not recommend highly enough!! Adam played at my daughter Lauren's 21st and was absolutely awesome. Couldn't recommend him highly enough. AC knell dj'd at our wedding and has done for other family and friends events too, he is amazing at what he does and really easy to talk to, even provides you with photos of your eve which he takes during his set. Highly recommend him. Amazing DJ and enjoy when he is town to play!